I’m writing to provide you with a few facts related to a proposed new student organization on our campus which has received media attention over the past 24 hours. On November 10, the Campus Life Committee of the Faculty Senate met with a group of students who seek to establish an affiliate chapter of the Young Americans for Freedom (YAF) at Samford. The Faculty Senate committee followed the regular process for reviewing and approving student organizations, which includes approvals at meetings of the Student Senate, the Campus Life Committee, the Faculty Senate, the University Faculty and, eventually, the Board of Trustees. The process offers the opportunity for faculty members to ask student representatives questions regarding their plans for a proposed organization. During the meeting in which the YAF chapter was under consideration, some members of the committee asked questions regarding the planned activities of the group, ideas for promotion, and the YAF statement of purpose. I believe that the statement of purpose for the national organization and affiliate chapters is tied to a document known as the “Sharon Statement,” written in 1960 by William F. Buckley Jr. One of the specific elements of the dialogue within the committee meeting, which seems to be at the core of much of the current attention in social media, relates to a provision of the Sharon Statement which called for “victory over, rather than coexistence with” Communism. Herein lies much of the confusion, as the students and faculty involved in the meeting had different understandings of the exchange. The students believed they were told that this element of the Sharon Statement would need to be amended in order for the chapter to receive recognition; members of the faculty believed that they were only asking hypothetical questions in order to clarify the statement. Following the session with the students, the Campus Life Committee elected not to grant immediate approval for the organization and instead provided the students with specific feedback related to their application, expressing the intention to reconsider the students’ application when the committee next reconvenes. Throughout the past 24 hours, media outlets have misrepresented some of the facts related to this situation. 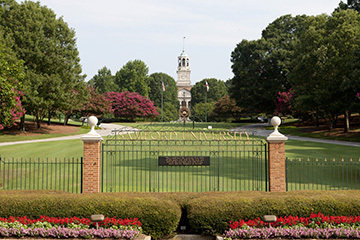 Among the errors is that the request for a YAF chapter at Samford has been rejected. Rather, the approval process for the organization remains in effect, pending additional information from the students at the next meeting of the Campus Life Committee. The media has incorrectly reported that the university is sympathetic to Communism and even inferred that we have now or at some time in the past had a “Communist Club” on campus. As you might guess, we have never had a Communist Club at Samford. Finally, as I highlighted above, the differing understandings of the dialogue regarding the Sharon Statement have led to such headlines as “Samford is a Haven for Marxists.” In fact, the Campus Life Committee requested technical improvements and clarification of the purpose statement in the proposed organizational constitution submitted by the students. Earlier today, students, faculty and staff who are involved in this matter visited via conference call with a national YAF representative to more thoroughly explain the issues and to dispel misconceptions. I’m told that it was a positive exchange and that everyone is hopeful for a smooth process as the consideration of the YAF chapter moves through the prescribed system for review. Both Karalee Geis, the proposed president of the YAF affiliate chapter, and Shannon Ashe, the chair of the Campus Life Committee, were involved in the conference call and each of them agreed with the plan for moving forward. Because of the rather bizarre comments that have been made regarding Samford in social media over the past 24 hours, I feel compelled to offer a few personal observations. First, I defend the rights of all people, even those within what many may view as the cloistered environment of a private university, to write and to speak. It is a First Amendment right and, I believe, a basic human right, therefore I think that it is not advisable to attempt to insulate either students or faculty from expressing or hearing opposing views. That being said, I can say with confidence that Samford is not a bastion of support for Communism. I think we have overwhelming agreement throughout the campus that Communism is a failed system. Even so, I am faced with the truth that, as Christians, we are compelled to show the love of Christ to all people, regardless of political ideology or any other factor. And I can’t help adding that I am a thoroughgoing Capitalist. Any questions or concerns you have about this issue should be communicated to Dr. Phil Kimrey in the Division of Student Affairs, which has administrative responsibility for the establishment of new student organizations on our campus. Any media inquiries related to this matter should be referred to Philip Poole, Executive Director of University Communication. And that’s all I know, at least for the moment.